Today’s wallpaper features a couple of my favorite things: the Paranal Observatory and a full moon. Gianluca Lombardi took this photo of one of the Auxiliary Telescopes (AT) at Paranal, using the colors of the sunset to their best advantage. 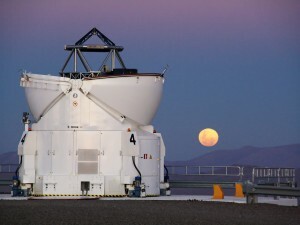 Visit the ESO website to read more about light scattering, the red moon effect, and the role of the AT in the VLT Interferometer (VLTI). Click on the image above to download the wallpaper or the original photo (download links will be in the page’s right sidebar).